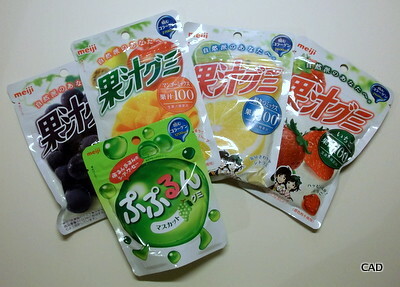 Here’s the rest of the Meiji Gummies first covered on Wednesday. Meredith: I have a problem with a lot of strawberry-flavored candy: I can’t stand peanut butter, and apparently over the years I’ve picked up an PBJ-mediated distaste for certain mass-produced strawberry jam flavors too. I like fresh strawberries and some strawberry-flavored products (again, Hi-Chew comes to mind), but this sort of mass-produced strawberry jam flavor is seriously offputting to me. 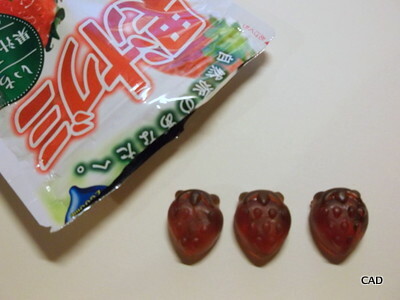 This strawberry gum actually had a peanut butter aftertaste for me that is almost certainly illusory, so I have to give it a highly subjective —. Meredith: First off, I loved the texture of the dome gummy! It has a sproingy outside layer and an oozy melty inside, much like an actual grape. 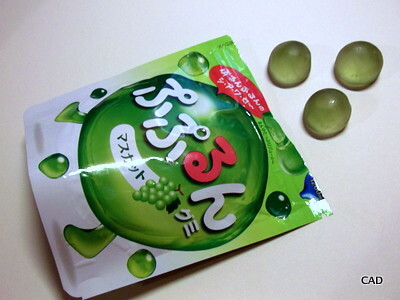 And its flavor is spot on in the “real grape flavor” category. Makes me want to go to the market and buy some Finger Lakes grapes! A solid OMG. We ended up rating the Pupurun a bit higher than Rosa did – I think this is the closest you’ll get to a direct comparison, so you can maybe say that we’re a hair less discerning than your usual host!